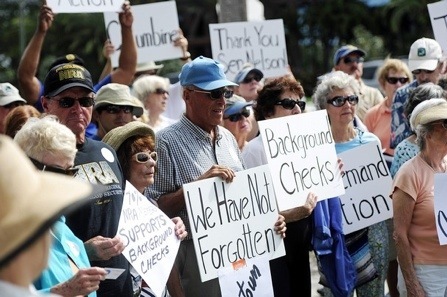 In Florida, supporters sounded off on the need to strengthen gun safety and reduce violence, some of whom also were members of the NRA. This has been a lousy week of murder in America. It’s also been another intolerable and telling week of cultural contrast best described by what President Obama today called “shameful” politics. When a terrorist bomb killed three and injured nearly 180 people in Boston two days ago, we reacted with sorrow and agitation and anger. We express a national resolve to study the weapon, hunt down the suspects, renew our collective spirit, and take necessary action to make the country safer. But we’ve chosen to continue to do nothing about the more serious threat: Gun violence. Since the Newtown shooting on December 24 — during which 20 students, six teachers and staff, the shooter, and the shooter’s mother were killed — almost 3,500 American men, women, and children have died in gun-related violence. Just since Sunday — four days ago — two children, five women, and 28 men died from gunshots. A miserably revealing compendium of gun deaths since Newtown is posted daily by Salon.com and should be regularly visited by Americans interested in reducing actual risks to our lives. Today the U.S. Senate blocked proposed legislation that would have required background checks for gun buyers who purchased weapons from gun shows and from other unregulated markets. That represents about 40 percent of gun sales. The proposal is a baby step, but a step nevertheless. Enacting that tiny change would signal that the U.S. could actually act to limit a public health hazard so serious that it threatened, as we’ve seen over the last generation, students in grade school and college, adults in a movie theater, innocent bystanders on ordinary streets, adults killed by children, and children killed by adults. I understand the influence of the gun lobby. I also understand the influence of the oil lobby, the chemical lobby, the drug lobby, the auto lobby. They all were challenged and made their products safer. — Big oil is bending under the civic weight of the potential risks of fracking. The federal and state governments are passing safety measures. — The risk of part-per-billion exposure to toxic chemicals in air and water prompted passage of hazardous chemical operating and disposal laws. — When seven people in Chicago were murdered in 1982 after taking poisoned Tylenol, new standards of manufacture and packaging were levied on the drug industry. — The auto industry, which fought seat belts and airbags and more stout bumpers as customer turnoffs and too expensive, now make safety a primary message of their advertising. So why does America tolerate the actual, proven risks of gun violence? How is that the gout of blood, the bang-bang-bang of gun violence that has actually killed 3,492 children, women, and men since Newtown compels us to do nothing to make America safer?